Not sure where the potatoes were sneaking in, [24Gospel] did what any decent hacker would do: strapped a camera to a Raspberry Pi, hacked a bit on OpenCV, and built himself a potato detection system. Now those pesky Russets can’t get into the house without tripping the tuber alarm. OK, seriously. [24Gospel] works for a potato farm as a systems/software developer. (How big does a potato farm have to be to require a dedicated software guy?) 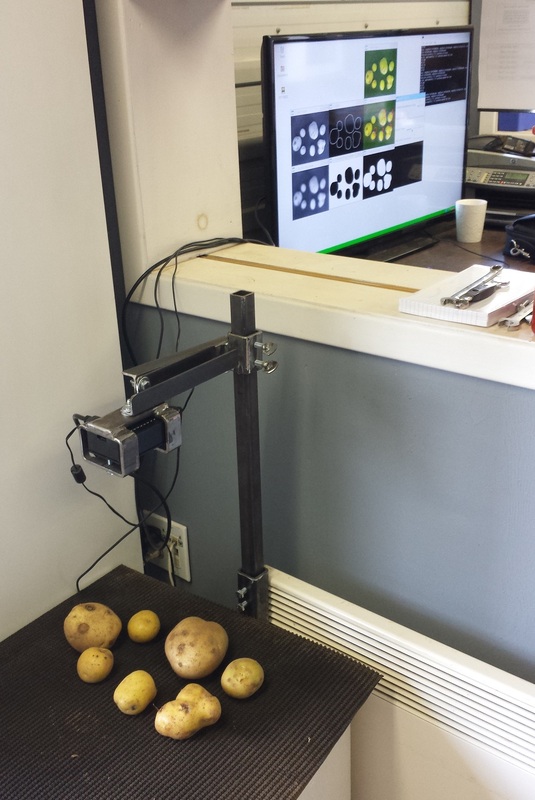 His system is still a first step, but the goal is to grade the potatoes, record data about size and defects, and even tell different potato types apart. And he’s found decent success so far, especially for the money. We don’t often build projects that need to operate in hostile environments, but we appreciate the nice plastic case and rugged adjustable steel frame that supports the Pi and camera over the sorting bed. Even more, we applaud the hacker spirit here. [24Gospel] is obviously working in a serious production environment, but still he’s trying out new things in an attempt to make it work better. While it would be impossible to quantify the impact of this kind of on-the-job ingenuity, we bet it’s not insignificant. Why don’t we see more documented workplace hacks around here? Would the unsung heroes please stand up? This footage called Industry on Parade is a unique look back at the golden age of plastics. We also value the footage as a look at America’s manufacturing sector at its height. We remember a middle-school teacher recalling his father — who was a research scientist working at Dow — bringing home a pair of discs for him to play with. His first ever encounter with plastic. Here we see a snapshot ten years after plastic manufacturing went mainstream. It starts off with a tour of an injection-molding factory. The screenshot seen above is from the second vignette which tours a production line for naval ship models which will be used to train Navy personnel and as props for strategic planning maps. The film wraps up with the production of plastic fabrics starting with raw materials and ending with synthetic bug screen. Just to prove it’s an authentic blast from the past, hang in there for the last two minutes when you get an anti-communism PSA. Classic.